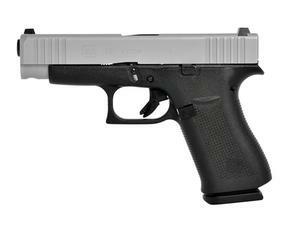 Part of Glock's Silver SlimLine series, the New G48 combines the size of the G19 but with the slim width of the G43X. The magazine capacity is 10 rounds due to the extended grip frame. Features an nPVD silver finished slide and front serrations. This model includes factory Glock Night Sights installed.